"Feels great, looks elegant, and is relatively inexpensive." "Great for amplifying water flow in homes with lower water pressure." "Robust flow and high-quality feel." "Installation is easy and you can see results right away." "Delivers a high-quality, luxurious spray." "The massage setting is powerful enough to soothe stiff muscles." "It aims to save families up to 8,000 gallons of water a year." "Creates a gentle, spa-like stream of water." Owners and experts say the Kohler K-10282-AK-CP Forte Single-Function Katalyst Showerhead hits a sweet spot: It feels great, looks elegant, and is relatively inexpensive to boot. The Forte’s single spray setting flows at a maximum 2.5 GPM, and Kohler combines a unique nozzle pattern and air infusion to create a more powerful spray. Most users say this showerhead delivers as promised: They don’t miss having multiple settings because the rain shower-like spray has just enough pressure to satisfy almost everyone—not too little, not too much. They also say it provides good coverage, letting them stay warmer in the shower. The showerhead itself is adjustable, with nozzles that resist hard-water buildup. Buyers can choose from four finishes for the Forte: polished chrome, brushed chrome, vibrant French gold, and oil-rubbed bronze. 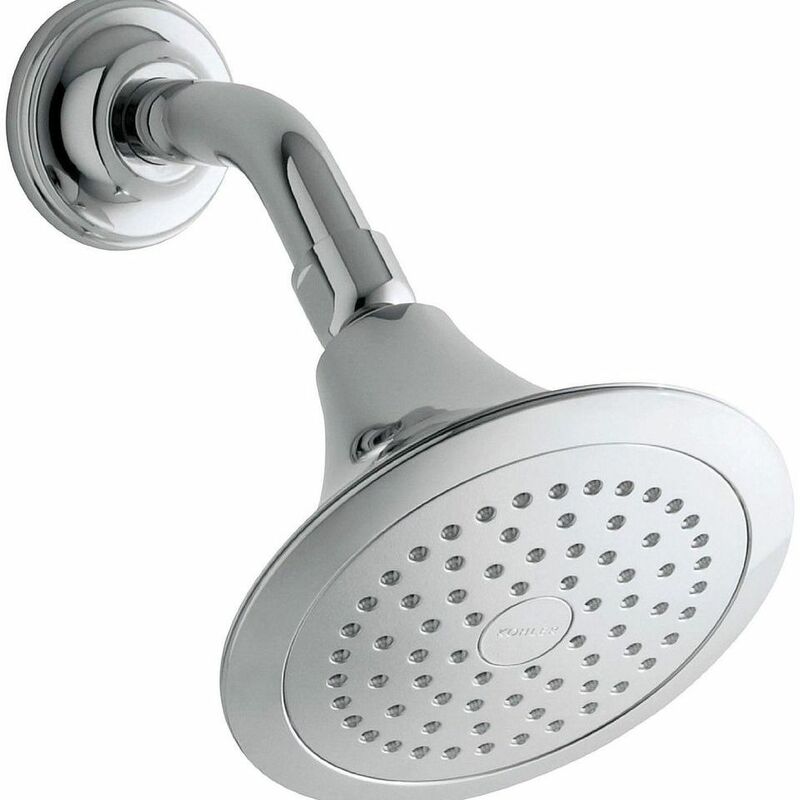 Owners like the large, gently flared showerhead, which measures about 6.75 inches across. Most say installation was a cinch, even for those who aren’t handy. It’s covered by a limited lifetime warranty. The American Standard Easy Clean Showerhead won’t bust any budgets, but it also doesn’t skimp on quality. The showerhead aces experts’ tests for shower feel, water temperature, and ease of use. There aren’t a lot of special features on the Easy Clean—this is a model for anyone who likes their showers plain and simple, which makes it a great choice for guest baths or vacation homes. The sole spray setting flows at a maximum 2.5 GPM. Most owners are happy with the feel, though a few find the spray a bit too narrow. Reviewers say this is a particularly good pick for amplifying water flow in homes with lower water pressure, and they like the lime-resistant easy-clean nozzles. You won’t get a range of finishes here: The corrosion-resistant Easy Clean is available only in polished chrome. The small, bell-shaped head is just over 3 inches across and has a traditional look. Users say it was very simple to install, though some say they needed to replace the flow restrictor with a small washer to get the promised flow. It’s covered by a limited lifetime warranty. With six plungers that multiply the water into 48 sprays, the Speakman Icon is hard to beat for a robust flow and high-quality feel, reviewers say. Available with a flow rate of either 2 or 2.5 GPM, it also comes in an impressive six finishes: brushed nickel, oil-rubbed bronze, polished brass, polished chrome, polished nickel and matte black. There are three flow pattern options on the Icon: intense, which doesn’t allow intersecting sprays for a more powerful feel; rain, which features larger water drops; and flood, which thickens sprays for an intense feel. Owners say the sleek side handle adjusts smoothly between each flow pattern, and they say that it’s easy to find a flow that feels customized enough to their liking. They also say installation is easy – the showerhead even comes with plumber’s tape to speed the process. The Icon has a classic look that most owners appreciate, though some buyers may find it boring, especially for the price. It’s backed by a limited lifetime warranty. Nothing is worse than a shower that has low pressure. If you live in a home or an apartment that has a less than stellar showerhead you might want to try The Original Fire Hydrant Spa Plaza Massager Shower Head. This showerhead will not only increase the pressure from your city or well water it will also give you some various settings that vary from a spray to a massage setting. Installation is easy and you can see results right away. Reviewers agree that this has increased their pressure and performs just as well if not better than the more expensive models out there. Reviewers say the Moen S6320 Two-Function Rainshower Showerhead with Immersion Technology delivers a high-quality, luxurious spray. Experts agree, giving it top marks. There are two spray settings on the Moen S6320: rainshower and concentrated rinse. Both have a maximum flow of 2.5 GPM and earn raves from users, who can switch between them with a simple lever. Moen uses a unique pattern of spray nozzles to better concentrate water flow and force, and reviewers say they can tell the difference. Users also say the rain shower setting is truly drenching, just like standing outside in a storm. The all-metal Moen S6320 is available in chrome, brushed nickel, antique bronze and oil-rubbed bronze. This flat, circular showerhead is 8 inches across and better suited for transitional or contemporary bathrooms. Reviewers give it top marks for quality and say it’s easy to install, though testers note the broad showerhead may prevent users from hanging a shower organizer. It’s covered by a limited lifetime warranty. Anyone who appreciates having a handheld shower to accompany their regular showerhead will like the Delta 58480-PK In2ition H20 Kinetic 5-Setting Two-in-One Handheld Showerhead. The Water-Sense certified In2ition provides both in one tidy, efficient package, and experts give it high marks for quality and versatility. Users say one of the best features of the In2ition is its range of spray settings: full, massage, full with massage and H20 Kinetic. All have a maximum flow of 2 GPM. The last setting twists water into larger drops, creating the illusion of more water pressure. The massage setting is powerful enough to soothe stiff muscles, note testers with The Sweethome. Users can use the showerhead in combination with the hand shower, or use either unit by itself. The hand shower docks in the center of the showerhead, and users say the hand shower’s flexible steel hose is long, sturdy and easy to use. The In2ition comes in three finishes: chrome, champagne bronze, and Venetian bronze. The large, gently rounded face is about 7 inches across and should fit well in most bathrooms. Reviewers say it’s easy to install in just a few minutes. It’s covered by a limited lifetime warranty. Even though it aims to save families up to 8,000 gallons of water a year, the American Standard Flowise 3-Function Water-Saving Showerhead doesn’t skimp on performance. This WaterSense-certified showerhead nails experts’ tests for water temperature, feel, and ease of use. The angle-adjustable Flowise has three spray settings: turbine, full, or combination. The first setting is 1.5 GPM, while the latter two modes offer a little more water at 2 GPM. Even if users do opt for full or combination mode, the Flowise automatically reverts to 1.5 GPM once it’s turned off. Reviewers are complimentary of all modes, saying it’s an especially good pick for homes with low water pressure. They also love that it makes their hot water last a lot longer—ideal for big families. Available in satin or chrome finishes, the Flowise is a bell-shaped showerhead that will blend in traditional or transitional bathrooms. A “vandal resistant” version adds a tamper-proof metal sleeve that keeps the showerhead firmly in place. Though most owners say it was easy to install, many complain no instructions were included. The showerhead comes with a one-year warranty. For those who want a more luxurious way to shower, a rain shower head creates a gentle, spa-like stream of water that will leave you feeling infinitely more refreshed and relaxed. Enter the ANZZI Pure 3-Jetted Full Body Shower Panel System, which comes with three adjustable jets and two control knobs—and most importantly, a heavy rain shower head that delivers a high pressured yet soothing stream designed to thoroughly massage the body. In addition to being highly efficient, the ANZZI Shower Panel System also boasts an elegant, European look and feel, with its chic modernist angles, tempered deco-glass, gleaming brass valves, and sleek mahogany-style finish. Our reviewers spent five hours testing a top-selling showerhead. To get the most comprehensive feedback, our testers installed and used this showerhead morning and night for weeks on end. We had them consider its most important features — from how easy it was to mount to its spray pattern — and we've outlined the major takeaways here so that you, too, know what to look for when shopping. Type There are three main types of showerheads: fixed, handheld, and dual (a combination of fixed and handheld). Fixed showerheads are mounted to the wall, while handheld showerheads are connected to the wall via a flexible hose. Handheld or dual showerheads are particularly useful for pets, kids, and anyone with limited mobility. Spray pattern Showerheads come in many different spray patterns, and some even come with adjustable spray patterns. Some common ones include rain, massage, and jet. Rain provides wide, gentle coverage, while jet and massage are more targeted and forceful. Mount Showerheads are either wall mounted or ceiling mounted. Unless you’re renovating your home (or building a new one), the type of mount you choose depends on your existing plumbing configuration. Wall mounts are much more common, especially in older homes and apartments. This showerhead satisfied our testers because it applied good water pressure for a reasonable price. And it looked nice, too: “It's modern, the chrome shines, and it looks more expensive than it is,” noted one reviewer. And, although this showerhead does swivel, one of our testers wished you could also adjust the water flow as needed.